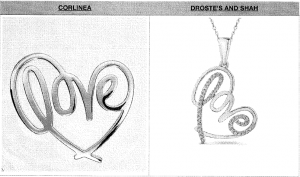 Indianapolis, Indiana – Attorneys for Plaintiff, Corlinea, LLC of Chandler, Indiana, filed suit in the Southern District of Indiana alleging that Defendants, Drostes Jewelry Shoppe Inc. (“Droste”) of Evansville, Indiana, and Shah Diamonds, Inc., D/B/A Shah Luxury (“Shah”) of New York, New York, infringed rights in United States Copyright Registration No. VAu 1-301-361 the “HEARTY LOVE” design and United States Copyright Registration No. VAu 2-093-049, the “HEARTLINES LOVE PENDANT” design. Plaintiff is seeking an award for damages, attorneys’ fees and costs, pre-judgment and post-judgment interest, and other relief as determined proper by the Court. Corlinea’s principal, Sheryl Lutz-Brown, first began designing the works in question in 2016. Her concept was to find a unique way to incorporate the word “love,” and subsequently other words, into a heart shape with a continuous line. Corlinea is the owner by assignment of both of the copyright registrations in question here and has all rights, title, and interest in all causes of action for infringement. In November 2016, Sheryl met with Droste concerning her new design to help guide her to a reputable manufacturer for her jewelry. After meeting in person, Sheryl provided a .eps file of her design to Droste to be sent to the manufacturer for a quote. The original quote for the CAD design and making of the first piece in Sterling Silver was $300.00, which Sheryl paid the following day. Over the next several months, Sheryl created at least five other designs and worked with Droste to fine tune each of them and have the CAD drawings and prototypes developed. While Sheryl had already paid $9,714.53 to Droste and had another $14,000.00 ordered, Droste refused to supply an invoice for Corlinea. Sheryl discovered that Droste was working with Shah for the manufacturing in June 2017 with the prototypes arriving from Shah at Droste’s in July 2017. In September of that year, Sheryl became concerned with the working relationship as there were significant price increases and inconsistencies for production when she asked about pricing for a larger lot production of her jewelry. She requested the CADs at that time, which were not provided to her. After further negotiations, Sheryl was still not provided the CADs and Droste told her that Shah would not be releasing the files to her as she had “paid only for design services and development to produce each prototype in every size.” A demand letter from Sheryl’s attorney to Droste want unanswered. During January of 2018, Sheryl became aware that either Droste and/or Shah were offering for sale via Shah’s website substantially similar or copied jewelry from her designs. 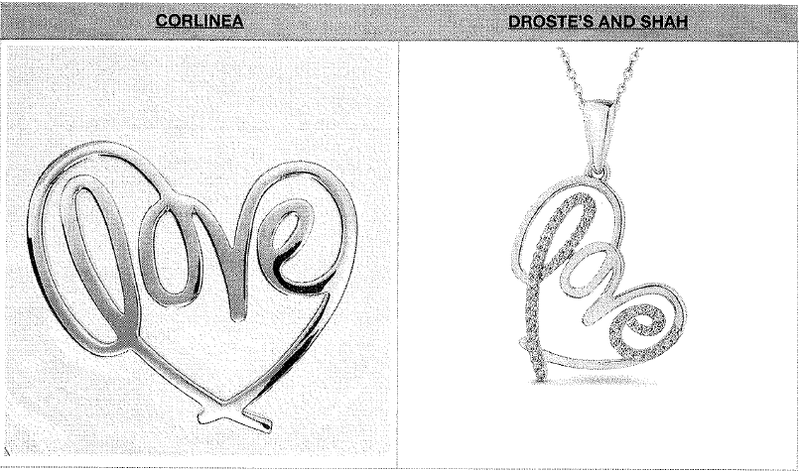 It appears the only variations from her design are diamonds added to the “l” and “e” in love and a loop added on the top of the heart for a chain. Because of this, Corlinea is alleging direct federal copyright infringement, contributory federal copyright infringement, and vicarious federal copyright infringement, all pursuant to 17 U.S.C. § 501. The case was assigned to District Judge Richard L. Young and Magistrate Judge Matthew P. Brookman in the Southern District and assigned Case 3:18-cv-00099-RLY-MPB.